Inductively Coupled Plasma-Mass Spectrometry presents a concise A-Z description of inductively coupled plasma-mass spectrometry, written in layman's terms, for use in the solution of trace element analytical chemistry problems. Detailed discussion of sample introduction and data interpretation is provided. Practicing analytical chemists will be able to use this text to familiarize themselves with the principles, approaches, options, pitfalls, and advantages of ICP-MS technology. Introduction. Atomic Structure. Inductively Coupled Plasmas. Instrumentation. Sample Introduction. Special Techniques. Quantitative Techniques. Interferences. Optimization. Figures of Merit. Appendix 1: Table of Elements with Atomic Number, Weights, and First and Second Ionization Potentials. Appendix 2: Isotopic Composition of the Elements. Appendix 3: Prominent Polyatomic Interferences Applicable for ICP-MS Determinations. Appendix 4: Table of Student's Distribution. Appendix 5: Certified Standard Reference Materials Available from the U.S. NIST and the NRC of Canada. Appendix 6: Supplemental References. Index. Howard E. Taylor is a research chemist with the National Research Program, Water Resources Division, U.S. Geological Survey located in Boulder, Colorado. 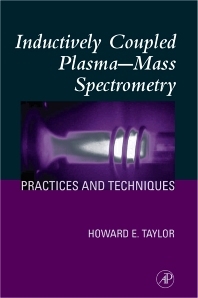 Dr. Taylor has played a major role over the past 25 years in the development of plasma spectrometric techniques in analytical chemistry, as reflected in his more than 150 technical publications and the presentation of numerous papers at national and international technical meetings. He has served as faculty affiliate at Colorado State University and has taught American Chemical Society Short Courses for more than 15 years. U.S. Geological Survey, Boulder, Colorado, U.S.A.
"The Editor, Professor Steve Hill, states in the preface that the purpose was to produce a book that covers both theory and applications in a concise, informative and readable form. This has certainly been achieved and the book is a very welcome addition to the literature.